This tangy salsa combines seasonal vegetables--corn, tomatoes, and peppers--into a base perfect for blending to make your own twist. This recipe can be canned so you can easily whip up summer flavors any time of year. Try it mixed with black beans, or chunks of avocado, stirred into taco meat or layered on a taco salad. What my kitchen looked like when I made this recipe. I was also pickling banana peppers and canning pizza sauce. Ok let's get a few things straight. First, I work on this site about a year ahead. That means what I am posting now are recipes I made & photographed a year ago. I do this mainly because by the time I get the photos edited and I'm ready to publish a post . . . I've missed the season. A top down view of my tall pasta pot that I use for smaller canning projects. This holds half pint and pint jars easily, but when canning quart size jars I'd rather use a full size canning pot. I inherited this pot from my mom. I mean, I harvested my garlic scapes in June, stuck them in the fridge, and didn't make my annual batch of Garlic Scape & Pistachio Pesto until July. 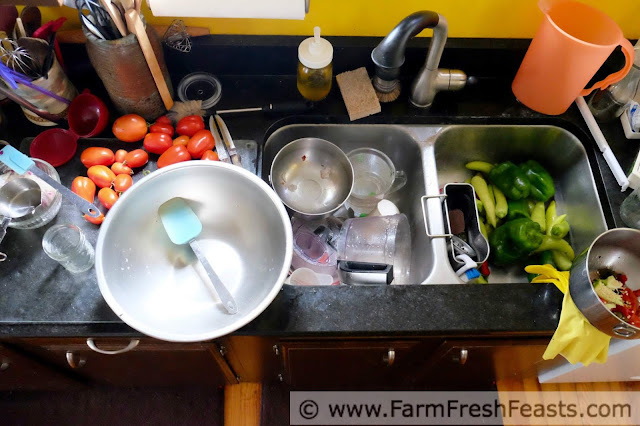 It makes no sense to me to offer ideas for what you could have done with your fresh produce from your Community Supported Agriculture (CSA) farm share at a time when you no longer have that item to work with. So I opt to make, photograph, and sit on the recipes until I can post just in advance of when folks would be receiving their farm shares. Second, as this month's recipes are showing, I made a lot of salsa last year. I'm so comfortable with salsa making that I'm teaching a salsa (how to can the tomato kind, not the dancing kind) class at my local community center next month. This year my cucumber vines are the darlings of the garden, so I am putting up several quarts of pickles each week. We'll do some taste testing over the winter and decide what's worthy of the website for next year. 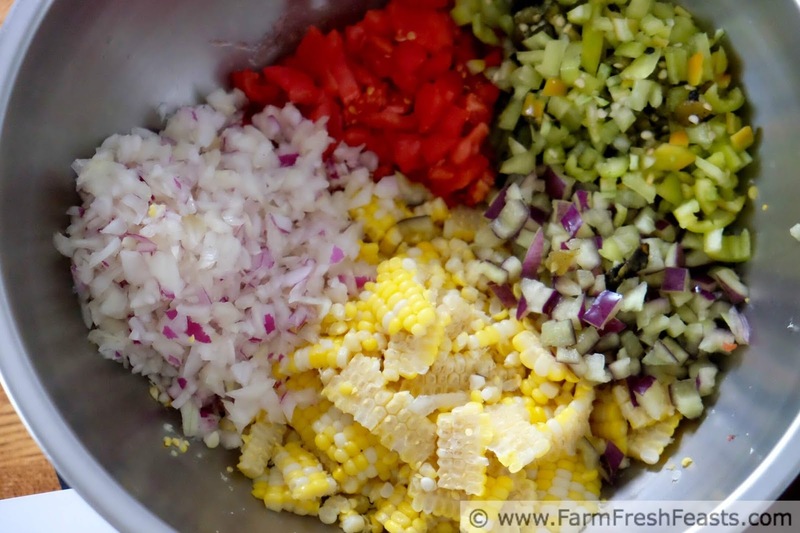 The ingredients for roasted corn and Hatch chile salsa--I used a many colored bell peppers from the farm share. Third, if nobody likes a recipe, it doesn't get up on the website. This recipe narrowly made it here. I don't care for the salsa straight out of the jar. It's too limey for my tastes, though I understand that to boiling water bath process these low acid vegetables you've got to add additional acid so that they are safely preserved. I know that taste is subjective, and maybe someone else likes that amount of tang. 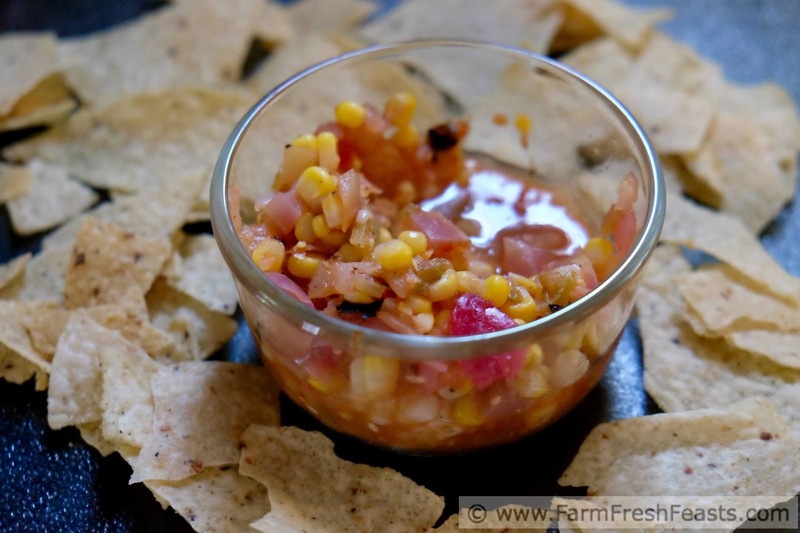 With the lime juice and spices added, this salsa is ready to be simmered. The reason I decided to put this up here is that this salsa is great when combined with other things. 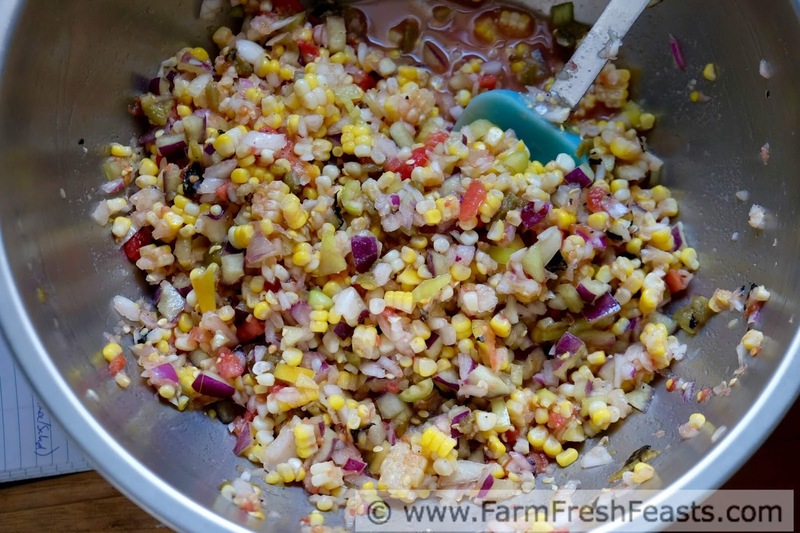 You know that cowboy salsa/cowboy caviar combination of corn, beans, tomatoes, peppers, onions, spices, and cilantro? Grab a jar of this, a bit of cilantro, and a can of beans and you're good to go. You may need to add a little salt, but otherwise all of the seasonings you'd desire are within a jar of this recipe. It's a fast and easy addition to a Make Your Own Layered Taco Dip Bar. 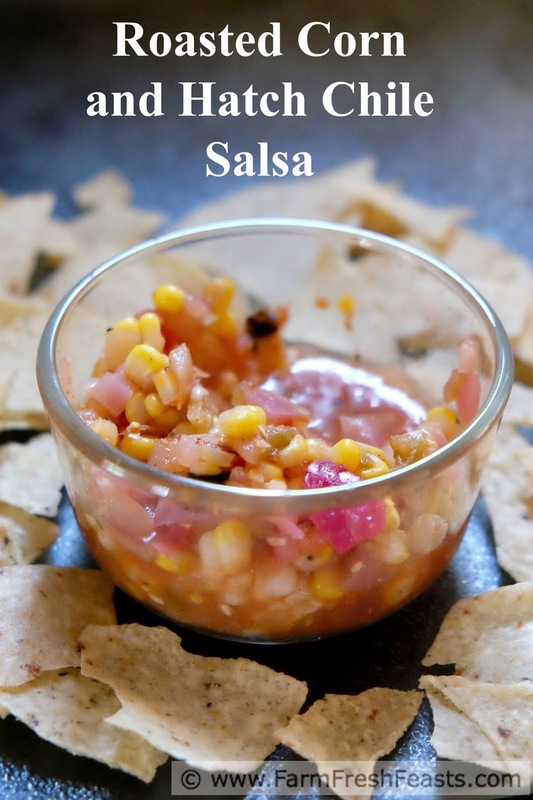 This salsa can be mixed in with taco meat to stretch a pound of ground beef a little further. Cube up an avocado, chop up a bit of cilantro, and you've got a tasty snack for some sturdy chips. I know there are ways I haven't even dreamt of to use this. So I think it's a worthy addition to my Visual Recipe Index. Robert Barker is providing a visual guide to just how tall my pasta pot actually is. Thank you, Robert, for your service. Speaking of my recipe index, for more recipes using corn, please see my Recipes Using Corn Collection. For more recipes using Hatch chiles, please see my Hatch Chile Recipes Collection. These collections are part of the Visual Recipe Index by Ingredient, a resource for folks like me eating from the farm share, the farmer's market, the garden, the neighbor's garden, and great deals on ugly produce at the grocery store. I always wear gloves when dealing with hot peppers. Otherwise my throat feels weird. Odd, that. Now, a couple of notes about this recipe. One last thing--this recipe calls for a peeled tomato. I found it easier to just save out a few extra prepared tomatoes when canning tomatoes, than to go to the hassle of preparing a boiling water bath plus an ice water bath just for one tomato. I've heard about this Tomato and Fruit Peeler (Amazon affiliate link) but haven't tried it. One thing I like about canning is the built-in breaks. While the salsa is simmering and the canning pot is coming to a boil, I can pause, take a drink, clean up the kitchen, take a photo, etc. This recipe can be canned or can just be simmered and refrigerated. If you're canning this, wash 4 half pint jars (I think it's the most useful size since I blend this with other things) and add them to a tall lidded pot with a steamer rack or kitchen towel in the bottom. Fill the pot ⅔ full with water, cover, and place over medium high heat before you get going with the rest of the recipe. 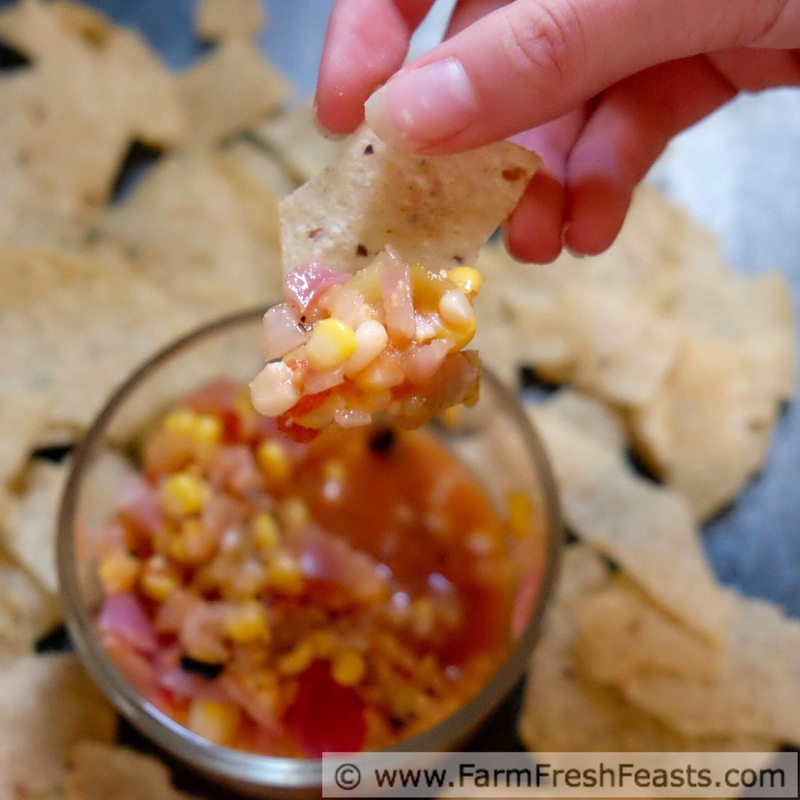 Bring salsa to a boil over medium high heat, then reduce heat to medium and simmer for 10 minutes. Place a kitchen towel on the counter while the salsa is heating. When the salsa has finished simmering, remove the jars from the tall pot and and ladle salsa into them. Make sure to leave about ½ inch of space at the top of the jar. 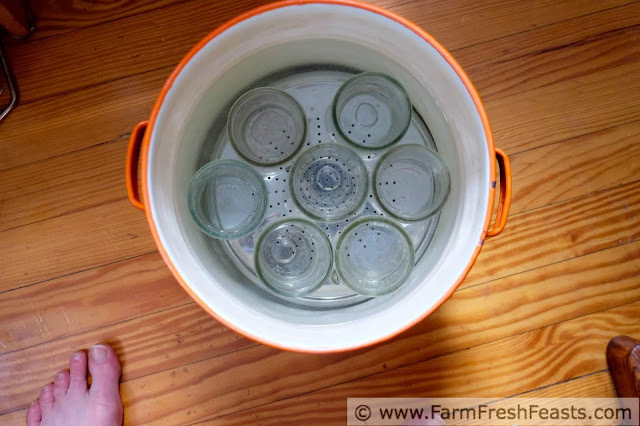 Wipe the rims with a damp paper towel, and apply a lid and a ring to each jar. Tighten the ring just until you get resistance--no need to crank on it. Return the jars to the tall pot and make sure the water covers them by 1-2 inches. Cover the pot. 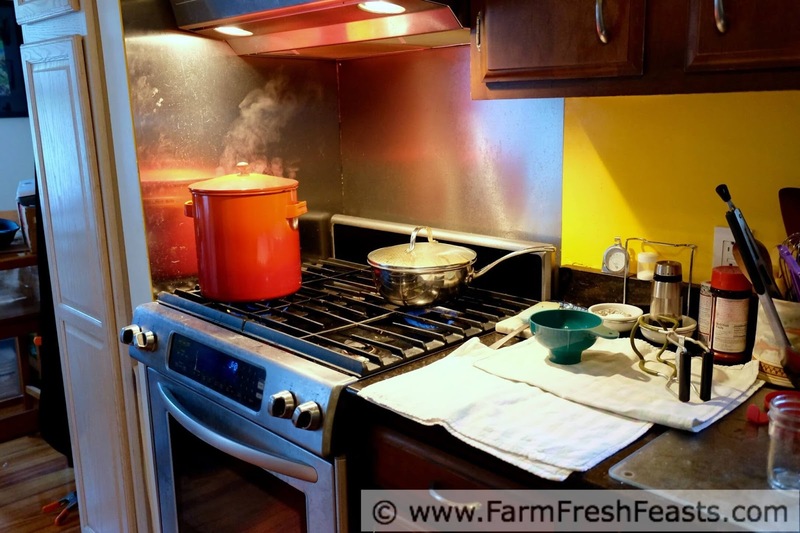 When the water in the pot returns to a boil (I can see steam escaping from mine) start your timer. 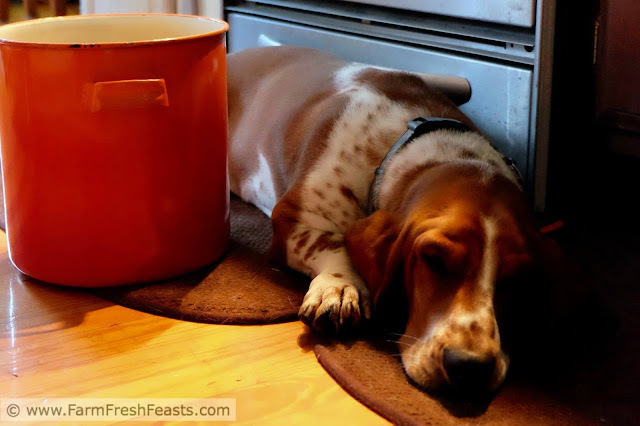 After 15 minutes, turn off the heat and remove the lid from the pot. 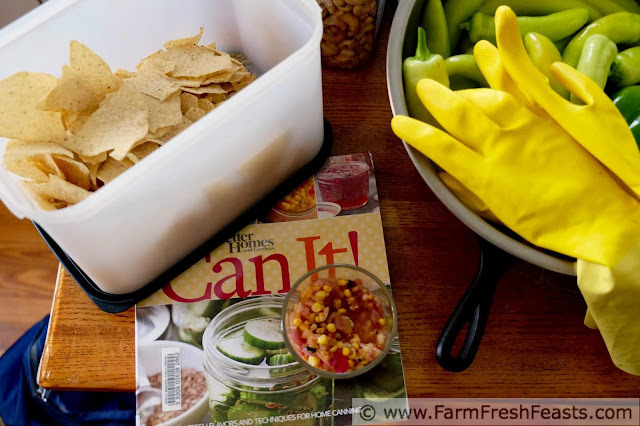 Remove the processed jars and place on the kitchen towel. Listen for the Ping! sound that occurs when escaping air forms a vacuum to seal the jar. It sounds like this. Leave the jars undisturbed for 8-24 hours, then remove the rings. Lift each jar up by the lid. If the lid has sealed, you can do this. If the lid lifts but not the jar, refrigerate the jar and use it up within a week or so. I prefer these handy plastic storage caps (Amazon affiliate link) for jars in my fridge that I frequently open and close. They are reusable and work great for transporting salads in a jar, smoothies, etc. Store salsa in a cool dark place, use within a year. I've tried it mixed with black beans, or chunks of avocado, stirred into taco meat or layered on a taco salad. I prefer it combined with other things to just straight out of the jar on a chip. I wish I could come to your canning class even though I had the personal session two years ago.